I've been in a cooking rut lately...or just really, really busy with life outside of the kitchen...or both. Life has been crazy busy. My boys both started school last week and this week and I have a huge project at work that has me going in at odd hours day and night...so, I've been thinking of recipes, but haven't had much time to play in the kitchen. Finally, today, I took the afternoon off of work (mainly because I had to go back in later in the evening) and I finally got to test out one of the recipes that has been stewing in my head for who knows how long. And can I just say, it's amazing...really, it's about the best granola I've had. And what's great about this recipe is that you can easily change it up pretty much any way you want to with nuts, fruits, etc. This post is featured on Allergy Free Wednesdays, Allergy Friendly Friday and Whole Food Fridays. Preheat oven to 300F. Grease a large baking sheet/pan and set aside. Combine the oats, nuts, buckwheat, and seeds in a large bowl. Add in the honey, coconut oil, vanilla, and orange juice and mix until everything is evenly coated. Spread the mixture onto the baking sheet and bake for ~45minutes, stirring every 15-20 minutes. Remove from oven once the granola has turned a golden brown. 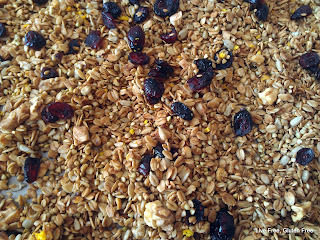 Mix the orange zest, cranberries, and apple pieces into the granola. 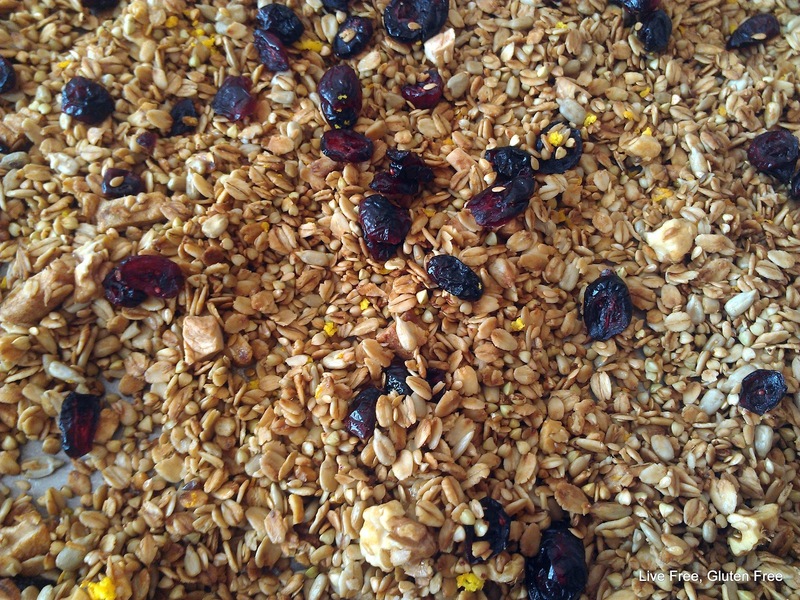 Continue mixing the granola every half hour while it cools on the baking sheet. Once cooled, place granola in an airtight container. If stored at room temp it should be good for about a week. If stored in the freezer it will last a couple of months. I also have green leafy lettuce, oranges, apples, peaches, corn on the cob, potatoes and carrots to supplement the basket. This week for breakfast: There is Double Chocolate Zucchini Muffins, Banana Chocolate Chip Muffins, and Pumpkin Chocolate Chip Muffins to choose from, fresh fruit, and cereal for the kids; and smoothies, water kefir with fruit puree, scrambled eggs, fresh fruit, and baked oatmeal for me. This week for lunches: School is in full swing now for both of my boys: my older son is in second grade and takes a lunch from home, my younger son is in preschool and eats lunch at the sitters--she does an awesome job taking care of him. For myself, I plan on eating leftovers, I'll also have carrots and cauliflower with hummus everyday and a glass of water kefir with fruit puree (a good portion of my nectarines, and cherries will go to that). My husband always has sandwiches, chips, and a banana in his lunch (boring, but that's what he likes). I'm taking part in Adopt A Gluten-Free Blogger again. If you’re not familiar, Adopt A Gluten-Free Blogger is a monthly event created by Sea at Book of Yum to help us gluten-free bloggers get to know each other and recreate each others recipes. This month it is hosted by Alta from Tasty Eats At Home. This month, I adopted Danielle from Against All Grains. Danielle was diagnosed with Ulcerative Colitis at 22, and after suffering for a few years, decided to take her health in her own hands by drastically changing her diet. 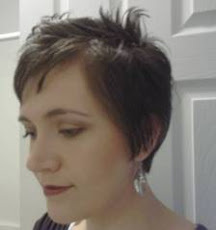 Her blog is perfect for those on gluten-free, Paleo, Primal, SCD and GAPS diets. 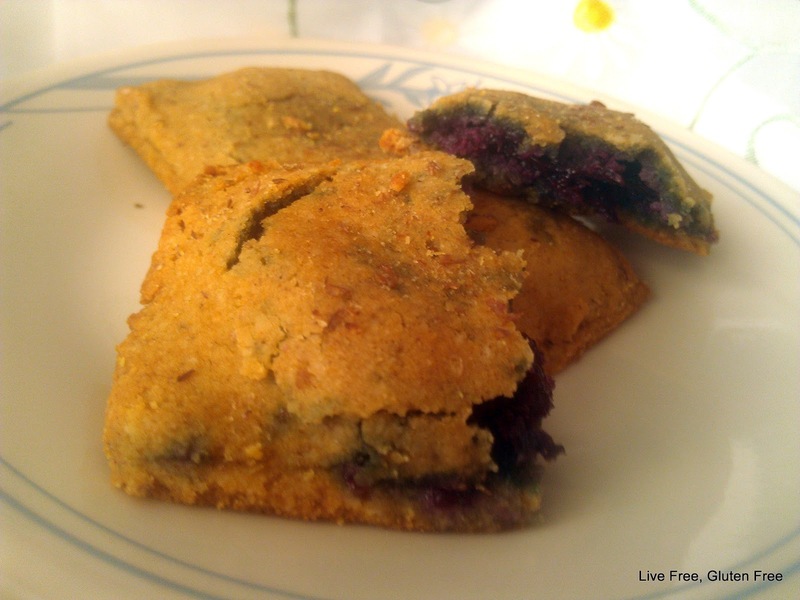 Everything is grain-free and refined sugar-free, along with most also being dairy-free. Her recipes are incredible, so it was hard to choose what to showcase on here. 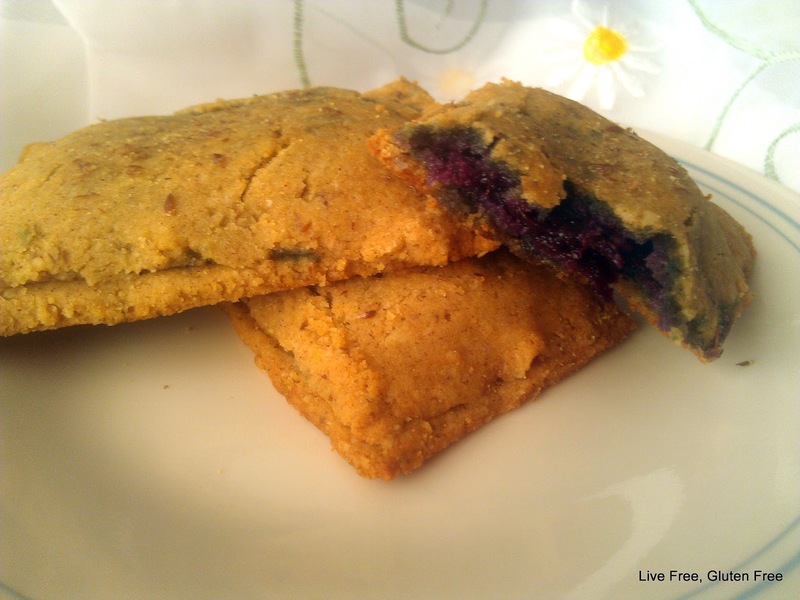 I decided to go with her Not-a-Grain Bars (gluten-free 'cereal' breakfast bars), which meant I also would get to showcase her Blueberry Preserves, since they are part of the bar recipe. So, first let's talk about these preserves. 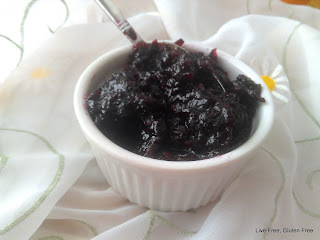 I've been cutting back my refined sugar intake drastically (by the way, I feel so much better without sugar) and have been looking for a good refined sugar free jam recipe. So, when I came across hers I had to try it. It is super easy to make, and made just the right amount for me to enjoy. It would be easy to make a larger batch or to switch up the fruit, as well. This recipe will definitely be my new go-to jam/preserves recipe from here on out. 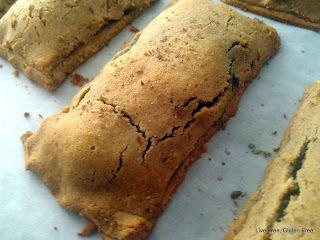 Now let's take a look at these breakfast bars. Don't they look delicious? Well, they are definitely delicious. They put Nutrigrain bars to shame with both taste and nutrition (and the fact that these are naturally gluten free). These bars a protein packed and only sweetened with honey, so there definitely is no reason to feel guilty about eating them. And on top of that, they are kid-friendly. My little one has been devouring them every day since I made them. So, they are the perfect snack to add to school lunches or as an after school snack. Really, this recipe will be made again and again in my house. ﻿Thank you, Danielle, for your incredible blog with these fantastic recipes! I also have cherries, lettuce, oranges, clementines, apples, red grapes, peaches, watermelon, green peppers, corn on the cob, celery, potatoes and carrots to supplement the basket. This week for breakfast: There is Double Chocolate Zucchini Muffins, Banana Chocolate Chip Muffins, and Pumpkin Chocolate Chip Muffins to choose from, one-eyed sandwiches, fresh fruit, and cereal for the kids; and smoothies, water kefir with fruit puree, scrambled eggs, fresh fruit, and baked oatmeal for me. This week for lunches: The first part of the week the both boys will be taken care of at their sitters' house. School starts on Wednesday, so my older son will be getting a lunch from home starting then. For myself, I plan on eating leftovers, I also have green peppers, carrots, cauliflower, and celery with hummus everyday and a glass of water kefir with fruit puree (a good portion of my plums, peaches, nectarines, and cherries will go to that). My husband always has sandwiches, chips, and a banana in his lunch (boring, but that's what he likes). French Toast (on Udi's Bread...I got the bread for a really good price), I like to top mine with almond butter, the rest of the family prefers maple syrup. I'm planning on bringing a dessert, I just haven't decided what to bring yet. I know, I know, I'm back to doing ice cream recipes. I haven't had time to do a lot of experimenting in the kitchen lately, so ice cream has been the easiest thing to play with. Growing up, my family would stop by Utah State's Aggie Ice Cream pretty much every time we went to Logan. 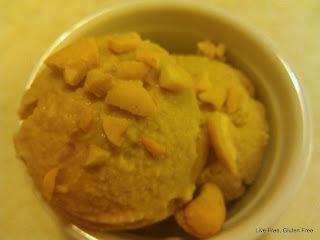 It didn't matter how many flavors there were, there were really only two in our minds: Lemon Custard and Caramel Cashew. I have a decent lemon custard recipe, but hadn't made a caramel cashew one yet, so I made a super easy one that doesn't require too much effort. The base is the same as for my double chocolate chip cookie dough ice cream. 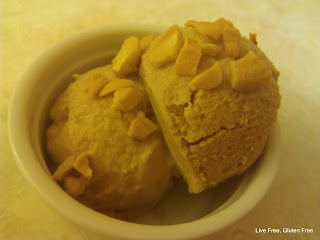 The coconut sugar (or brown sugar, if you prefer), gives is a nice caramel flavor. And then after making the base, it's simply adding in the cashews, easy as that. I added only 1/2 cup of cashews to my ice cream, and ended up sprinkling more on top to get the texture I wanted. This post is featured on Allergy Free Wednesday, Allergy Friendly Friday, and Gluten Free Friday. For the ice cream base, combine the milks, sugar, salt, and vanilla and chill in the fridge for at least 30 minutes. (I've discovered that having it prechilled yields a smoother ice cream). Then freeze according to your ice cream maker's directions. The last 5 minutes add in the cashews and enjoy! I also have grapes, cantaloupe, corn on the cob, and carrots to supplement the basket. This week for breakfast: I've replenished my muffin stock, so we have Double Chocolate Zucchini Muffins, Banana Chocolate Chip Muffins, and Pumpkin Chocolate Chip Muffins to choose from, one-eyed sandwiches, fresh fruit, and cereal for the kids; and smoothies, water kefir with fruit puree, hard boiled eggs, and baked oatmeal for me. This week for lunches: The boys are taken care of at their sitters' house. I plan on eating leftovers, I also have green peppers, carrots, mushrooms, celery, and tomatoes with hummus everyday and a glass of water kefir with fruit puree (a good portion of my mangos and cherries will go to that). My husband always has sandwiches, chips, and a banana in his lunch (boring, but that's what he likes). Pizza Pie Cafe : Which will include a specially made GF pizza for each of us, freshly made-to-order GF pasta and a salad bar. 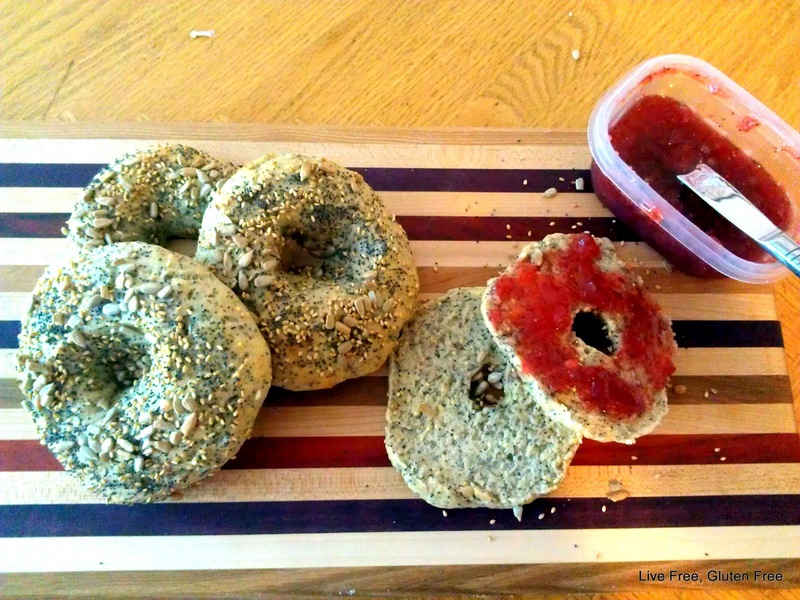 I really love my multigrain seeded bread, so I decided to convert it to bagels. Now, looking at the list of ingredients, it looks like an awful lot to have to measure out. Bread making tip #1: When you have extra time, measure out all the dry ingredients for you bread (minus the yeast) and place it in an airtight container...I make several batches of the dry ingredients, so when I want bread, I can pull out one of the containers and the wet ingredients and be done. It definitely makes this recipe much faster to make. 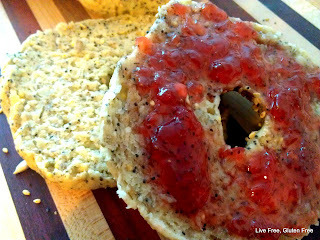 And bonus, the dry ingredients are exactly the same for these bagels as for the multigrain seeded bread. I have been having people ask me why their bread isn't rising, or how to get it to rise better. Gluten free flours like water...they absorb it, leaving the bread dense and dry, and unable to rise. Make sure you have enough water in the dough/batter, and let it rise in a humid environment. For a loaf of bread, I follow Nicole Hunn's advice, which is heat a very wet tea towel in a microwave. Once it is piping hot, quickly open the microwave, place the loaf of bread inside, put the hot towel on top and shut the microwave again. This closed environment should stay warm and moist enough for the 20-30 minutes needed to let the bread rise. If your recipe requires longer, just take the bread out and reheat the towel and do the same thing over again. Now for larger items, like a pan of bagels, rolls, or breadsticks...This will be basically the same type of thing, but in the oven, instead of the microwave. Heat the oven for a few minutes at 200F, then turn it off. Place a baking pan on the bottom rake of the oven and fill it with boiling water. Place the bread in the oven and leave the door shut until it's time to preheat the oven. Finish letting the bread rise on the countertop, while the oven preheats. Then you should be good to go! So, to summarize, make sure you have enough water present while the bread is rising for it to rise. Now on to the bagels. This recipe is a simple modification from my bread recipe and is easy to make, especially if you've premeasured the dry ingredients. This post is featured on Allergy-Free Wednesday and Bake Your Own Bread. In a small bowl mix together water, yeast, honey, oil, and vinegar. Let sit for ~3-5 minutes. In a medium bowl (I used my stand mixer for this), stir together dry ingredients. Add the yeast mixture to the dry ingredients and mix on low speed until combined. Once combined, mix on high speed for 3-5 minutes. Divide the dough into 4 portions. Grease your hands with shortening and shape each portion into a ball. Place onto a greased cookie sheet and poke the center with your finger. Move your finger around, until the hole is a decent size and the bagel now resembles a bagel. Place in a warmed oven (with a pan of hot water on the bottom rake) and let rise for 20-30 minutes. Towards the end of the rise, remove the bagels and the pan of hot water from the oven and preheat the oven to 400F. When the bagels have finished rising, place them one at a time in the boiling honey water. Boil on one side for about 30 seconds, then flip and boil it on the other side for another 30 seconds. Remove the bagel from boiling water and allow it to drain on a cooling rack, while you boil the other bagels. Place the boiled bagels onto a greased cookie sheet and sprinkle the tops with sesame seeds, poppy seeds and/or sunflower seeds. Bake bagels in preheated 400F oven for 20-25 minutes, or until they are a nice golden brown. Remove from oven, and allow to cool on a cooling rack for 10 minutes before enjoying. If you don't eat them fresh from the oven, store them in the fridge and reheat them in the microwave to make them taste fresh. 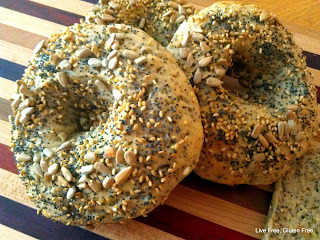 The bagels should last a few days if stored in the fridge and a few months if stored in the freezer. I also have grapes, cucumber, bananas, cantaloupe, corn on the cob, onions, garlic, and carrots to supplement the basket. This week for lunches: The boys are taken care of at their sitters' house. I plan on eating leftovers, I also have carrots, cucumbers, and tomatoes with hummus everyday and a glass of water kefir with fruit puree (that's probably a good portion of my mangos, peaches, and cherries will go).